Auto Scalability is the key feature of cloud computing. The ability of AWS cloud to manage the capacity of your environment automatically is a huge advantage for availability of the application. It has also reduced a lot of burden from operation teams. 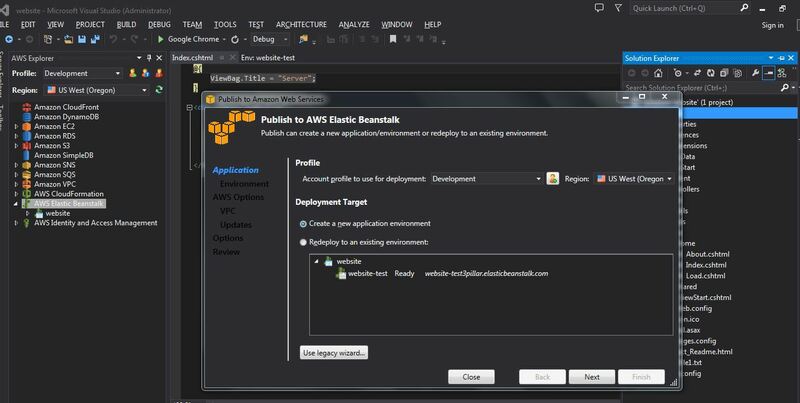 In this blog, I’II be focusing on deploying a MVC web application from Visual Studio to AWS cloud utilizing the auto scalability features of AWS. AWS provides a deployment service called Elastic Beanstalk; which can create a scalable environment on AWS in just 5 minutes. Let us go through this in detail. 1. 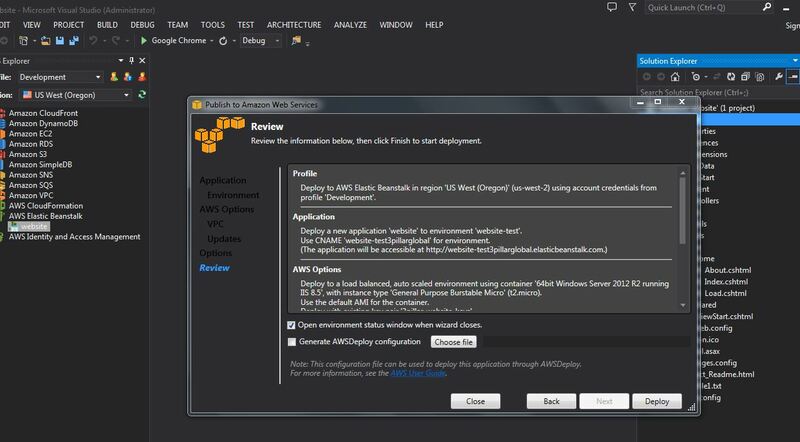 Download AWS toolkit for visual studio from http://aws.amazon.com/visualstudio/. 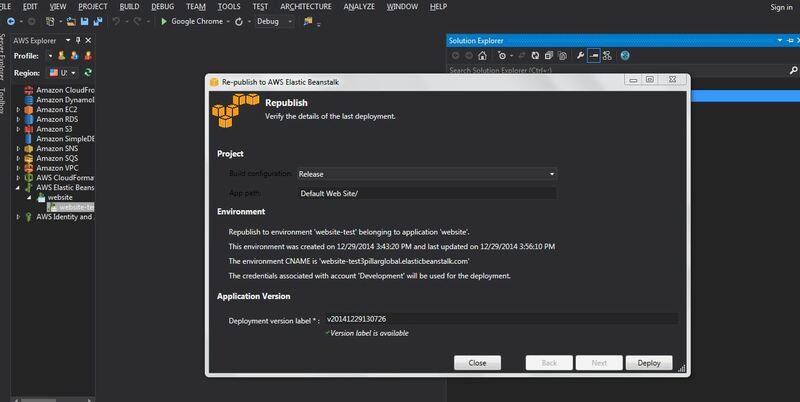 The tool kit enables developers to develop, debug and deploy AWS solutions right from their favorite IDE, i.e. Visual Studio. Similar toolkits are available for Eclipse. 2. Create a new user profile in AWS using Identity and Access Management. 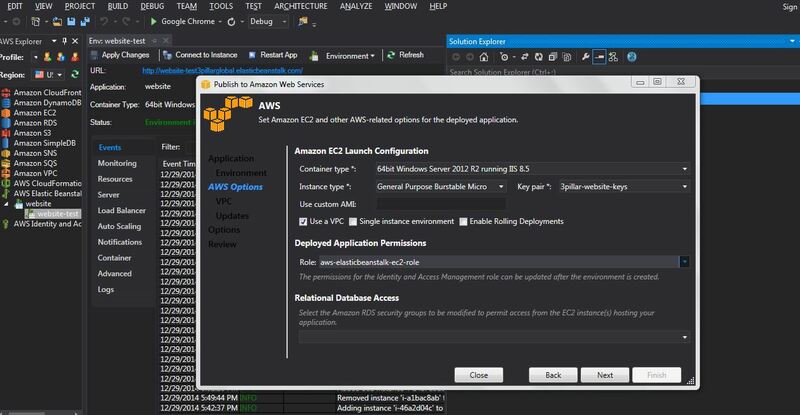 These user credentials will be used to access AWS resources for Visual Studio. Refer to http://docs.aws.amazon.com/AWSToolkitVS/latest/UserGuide/tkv_setup.html. The user should be based on the principle of least privilege. 3. 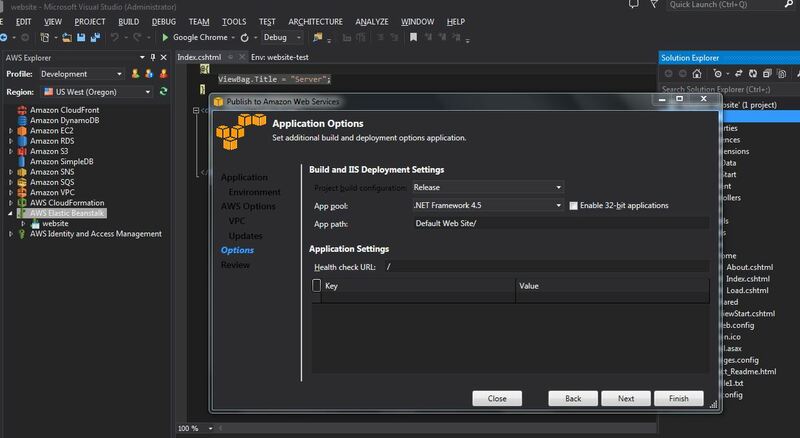 Create a new MVC application and deploy the same on AWS cloud by following the below steps. d. Set up the launch configuration setting for your environment. Here I am choosing a 2012 R2 server with IIS 8.5 with a very small EC2 instance type t2 micro. These instances should be further launched in a VPC. I am not using RDS service for this deployment but we can configure the database right from this screen. The roles and permissions under which these services will be launch can be modified after the environment gets created. 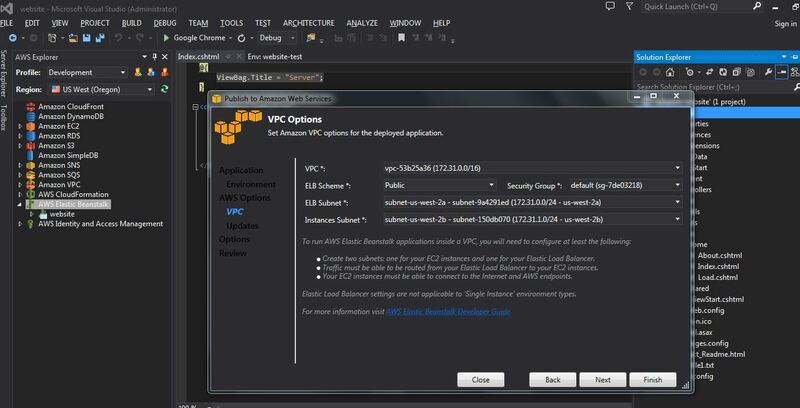 e. As I configured the environment to run in a VPC, I need to setup the VPC options. I am using the default VPC for this blog. I have already created 2 subnets as shown below. I am setting up the ELB to run in one subnet and EC2 instance to launch in the other subnet. f. Configure IIS and .NET framework setting. h. Refresh the node under AWS Elastic Beanstalk from left tree and check out the logs. The status of the environment should be launching. i. You can access logs that can be helpful to fix any setup issues. You can download the logs from S3 by clicking on logs. 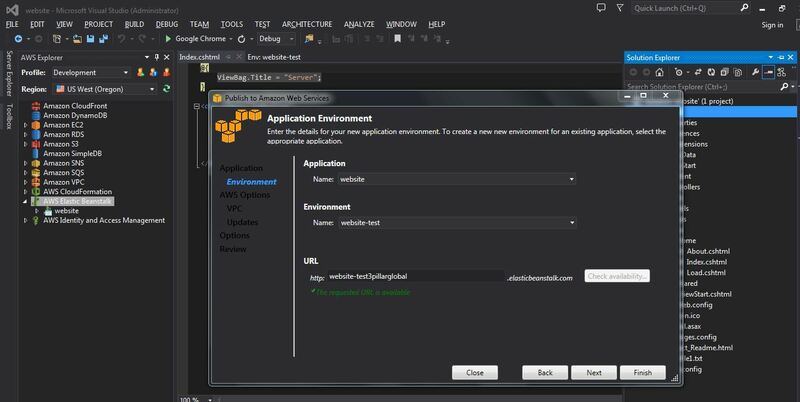 k. The environment can always be tweaked as per the requirement from the AWS console. Let me add 2 more alarms that will trigger the spawning of new server. The alarms will be based on CPU utilization. The first one will spawn up a new EC2 instance if CPU load remains higher than 60% for a minute. The other alarm will bring down an EC2 instance if CPU load remains lower than 10% for 1 minute. l. Now let us increase the load on the application. The application that I have built has a button which can increase the load on CPU. After a couple of minutes the CPU utilization will increase over the threshold and Auto Scaling will spawn another EC2 instance in the environment. m. The request to the server will now be shared between these 2 instances. ELB will redirect my request to these 2 different machines automatically. See below how the Server IP is different for the 2 different requests. n. Don’t put any further load on the server and you will see after a few minutes that the Auto Scale service will bring down one EC2 instance. o. So this is how auto scaling works. You must have noticed that the CPU usage indicator that has been shown on the above screens is 0. That is a bug in the code. So I need to fix and redeploy the application on the AWS environment. To do that, just republish to the Environment as below. p. As before, check the status within the Elastic Beanstalk service. It should first be in “updating” state and then should change into “Environment is healthy” state. I hope you have realized the power of Beanstalk and AWS auto scaling capability. I will appreciate your feedback in the comments section! Sure. let me know the architecture and any specific queries you have.